It’s the best of everything... a handsome piece of heirloom furniture and a safe, cozy home for your pet. Use it as an entertainment center, a curio table or sideboard. Give your dog a great place to rest with this dog box which can serve double as an entertainment center. 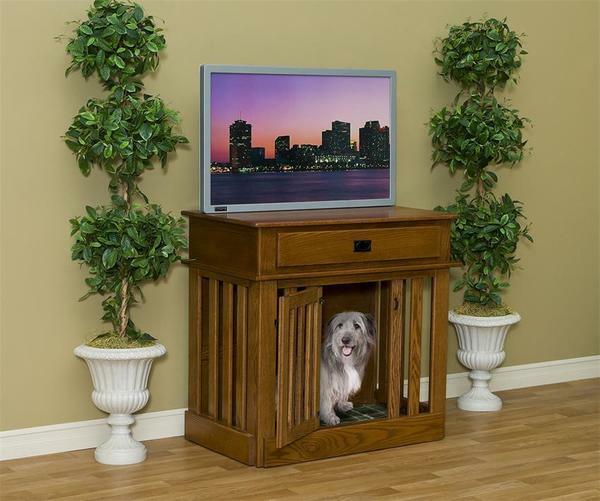 This entertainment center is a creative way to place your dog crate in the living room or family room. Dog crates don't have to be ugly anymore with our solid wood, attractive dog crates! This solid wood entertainment center is Amish handcrafted and built to last! This dog crate fits larger dogs and has solid wood slats. Choose to have this handcrafted in Oak, Brown Maple or Cherry wood. There is simple, easy assembly on this entertainment center.